Museum Series Aquabord™ is an acid-free textured clay surface that absorbs watercolours like a fine paper. Colours retain their purity and vibrancy in a way that even the finest of watercolour papers can never match. When compared with watercolour paper, this multimedia panel simulates the absorbency and texture of cold pressed, but allows colour to be lifted back to white easily while also leaving the richest, most vibrant colour possible. This workable surface provides natural looking highlights, fluid glazes, transparent subtle layers, and the ability to lift color while the surface is wet or even after it is dry. 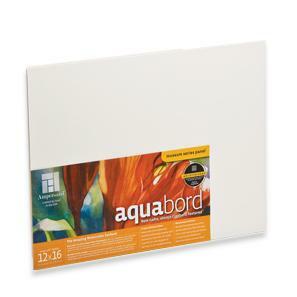 Uniquely absorbent Aquabord is perfect for watercolours and gouache, but is also ideal for casein and acrylics. Will not tear, shrink or buckle even under heavy water application. Archival, eco-friendly and made in the USA. For best results, it’s a good idea to first “flush out” the surface of the panel with water using a large flat watercolor brush to release trapped air. Once the surface is slightly damp, it is ready to use. Rewetting may be needed as you work. Note that heavy water applications may release more air. Use a blow dryer to dry and also to dissipate air if needed. Enjoy this unique paper-like finish and create brilliant watercolours! Great product! - Ampersand Aquabord 1/8" Deep 11"x14"
I think this is a really great product and even better than watercolour paper to work on, has all the good points but none of the bad IMHO. It is so easy to remove if required and seems to work so well in the normal way. Having seen this product for the first time in your Spring/Summer catalogue, I researched it on the Web to see the manufacturer's comments, which I found quite interesting. My comments are as follows - 1) They state that colours are brighter than on paper - I disagree 2) Colours can be removed easily, even back to white - I disagree - colours can be reduced, but I failed to get back to white. 3) I found it very difficult to paint on by my usual methods and had to use strong colour to stay on the board. It was difficult to do washes to look smooth and I was unable to achieve what I can do easily on my usual art paper. 4) If you try to mix colours on the board, it becomes 'milky' through lifting the clay surface I found the product to be less 'amazing' than the manufacturers and was disappointed with it.